Old spellings of Hittisleigh:, Hitensleia 1086; Hutteneslegh 1238; Hittenessleghe 1285; Uttensleghe 1291; Hettenysleghe 1351; Hyttingesleghe 1433; Hitsely, otherwise Hittisleigh 1820. The name probably comes from the Old English personal name Hyht, so it was ‘Hyhten’s Leah’ (leah meaning an open place in a wood or glade). The manor of Hittisleigh is first mentioned in the Domesday Book. It was smallish manor of some 626 acres. In 1086, there were 9 households in the manor, of which seven were “villagers” (the precursors of the later free tenants who became yeoman farmers) and two “slaves” who were bound to the lord of the manor. Some of the farms in Hittisleigh are therefore likely to be those occupied by the villagers of the Domesday Book, and therefore date back to Saxon times. In the 1200s, the “Men of Devon” purchased the right to plough up the King’s hunting forest. Quite a few Devon farms were created then. The lord of the manor would rent forested land to a would-be farmer, who would cut a path into his bit of forest (which explains why many farms have long drives) and build a home, gradually deforesting the rest of his land. Most of the other farms in Hittisleigh probably date from that period. Unfortunately, there is no way of telling which farms date from which period. Most of the present farmhouses date from the 16th to 18th centuries, no doubt replacing earlier more primitive ones. In the Middle Ages, all the farms were the property of the lord of the manor who let them out to tenant farmers, although often keeping one “home farm” for himself. In 1066, according to the Domesday Book, the lord of the manor of Hittisleigh was a Saxon called Doda. By 1086, Doda had been expropriated and William the Conqueror had allocated the manor to his main deputy in Devon, Baldwin the Sheriff, who had granted it in turn to another Norman, Ralph de Pomeroy, as under-tenant. It subsequently passed, probably in the early 1200s, to the Talbot family who also owned the neighbouring manor of Spreyton. The Talbots probably regarded Hittisleigh as a poor relation compared to Spreyton and sub-let it to a family called Cole. Luke de Buushele [Bewsley] paying 12d. (surnames only came in around the 1200s and it was normal for holders of land to adopt the name of their estate as their surname, so Luke would have been the tenant of Bewsley). The fact that the Coles were not paying markedly more tax than others in Hittisleigh indicates that by that time the other tax-payers had effectively established themselves as pretty independent. Although they would have paid a rent to the lord of the manor and had to attend the courts of the manor, they were probably in most respects akin to freeholders – and indeed a 1428 document records the manor as being in the hands of five freeholders. From the Coles the manor passed successively the Larder family; the Shilstone family; and by descent through the female line to the Calmady family. According to Lysons’ Magna Britannia published in 1822, the manor of Hittisleigh still belonged then to a member of the Calmady family. During the 17th and 18th centuries, however, many lords of the manor sold off the freeholds of the farms of the manor to their occupants and others. For instance, the Devon Archives have a deed recording the sale in 1643 of Hittisleigh Barton by the Calmadys to one Andrew Puddicombe of Hittisleigh. The evidence suggests that by the early 19th century Hittisleigh manor was not much more than a legal fiction and the farms were generally owned by freeholders who either lived on their farm or let it to tenant farmers. The following are the detailed histories of some of the farms in Hittisleigh up until the end of the 19th century. This farm was also known in the past as Haward, Hayward, Haywood and Heywood. The Place-names of Devon (the authoritative work published by the Cambridge University Press in 1932) does not suggest a derivation for the name. But “hay” may come from the Old English word for an enclosure and the name may mean “enclosed wood”. The addition of Barton to the name seems to have become common only in the later 19th century. Barton tends to indicate a large farm and no doubt it was thought smart to add Barton to the name. The farm would have been part of the Manor of Hittisleigh in the Middle Ages. But an effective freehold interest seems to have been sold by the lord of the manor fairly early on. Mark Delve, a “gentleman” of Cheriton Bishop, included in his will of 1615 a bequest of an annuity payable out of the rents of “Heywood in Hittisleigh”, which probably means that he owned the property at that time. By the later 1730s, the Cann family of Fuidge in the neighbouring village of Spreyton had acquired the property, as is shown by the fact that John Cann was recorded as paying the poor rate for the property at that period. The Canns also owned the neighbouring smallholdings of Teignholt and Teignholt Ford (on which see separate entry). They seem to have farmed them along with Howard, mostly using the houses belonging to the Teignholts to accommodate their farm labourers. Howard and the Teignholts remained in the same ownership until the 1870s. By 1782, the owner of Howard was William Cann. He owned several other farms but seems to have chosen Howard as his dwelling. He was childless and on his death in 1801 bequeathed his property, including Howard, to his brother George Cann of Falkedon (in Spreyton), another childless bachelor. George Cann did not enjoy the property long, and indeed it was the death of him, as in 1805 he was killed by a fall from his horse while riding at Howard (there is a reference to the accident in the Spreyton Parish Register). He was already 74, however, a good age for the period. He left his substantial property holdings, including Howard, to the son of his sister Mary, George Lambert Gorwyn of Lambert in Cheriton Bishop (1763-1837). 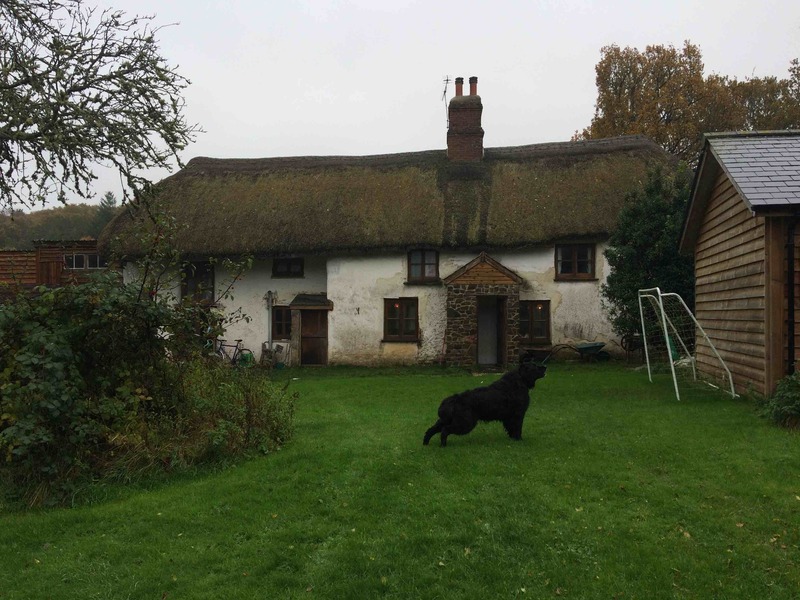 George made Falkedon his home, but appears to have farmed Howard himself for at least part of his life, probably putting farm labourers in the house. George Lambert Gorwyn was a rich man, the owner of a dozen farms. He had only one son, with whom he quarrelled. When he died in 1837, he by-passed his son and split his property between his two grandsons. Howard was one of the farms that went to his younger grandson, Richard Lambert Gorwyn (1819-1861). As Richard was a minor at the time, Howard was let by auction for four years to Mr Andrew Snell at £70 a year. George also left an annuity of £26 to his daughter-in-law Mary, Richard’s mother, payable out of the revenues from Howard. Richard was not interested in farming, and after reaching his majority continued to let the farm, living in Exeter on his rents. The tenant in 1842 was Richard Newton. The tenancy was subsequently taken over by William Newton, probably the son of Richard, and then by William Tucker. On Richard Lambert Gorwyn’s death in 1861, his property, including Howard, was left to his children. They appear to have struggled to keep his estate together and many of the properties were mortgaged. They were finally forced to sell the entire estate in 1872. A copy of the Bill of Sale is in the Devon Heritage Centre. It refers to ““Howard otherwise Heywood and Teignholt and Teignholt Ford in Drewsteignton and Hittisleigh”, consisting of 223 acres “with a convenient farmhouse and 4 labourer’s cottages, in the occupation of William Tucker as a yearly tenant”. The acreage of Howard itself was probably about 180 acres (in the 1842 tithe apportionment it was recorded as having 182 acres), large for the area. When it was sold, the estate was still encumbered with the annuity payable to Mary Lambert Gorwyn, Richard’s mother, who died only in 1875. A very desirable freehold property of 223 acres, 2 roods and 4 perches of meadow, pasture, arable, orchard, and woodlands, now in the occupation of Mr Samuel Kemble, as tenant (who is under notice to quit at Lady Day next), situate in the parishes of Hittisleigh and Drewsteignton, about two miles and a half from the Yeoford Junction station on the main line of the London and South Western Railway Company from London to Devonport, and about 6 miles from the town of Crediton. 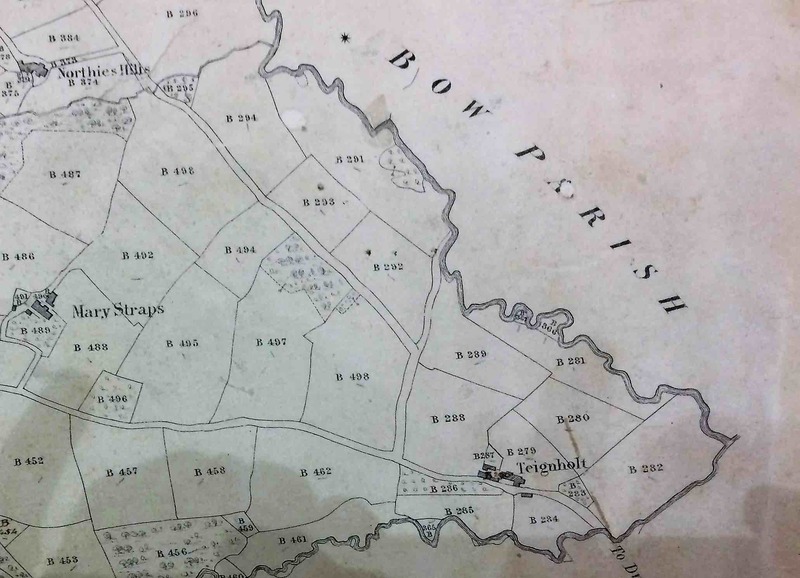 The estate comprises three tenements, namely HOWARD BARTON, containing 182 acres, 2 roods and 21 perches, together with a good farmhouse, farm yards, and all necessary buildings with three labourers’ cottages, all situate in the parish of Hittisleigh. TEIGNHOLT and TEIGNHOLT FORD, with two cottages, containing some 40 acres, 3 roods and 23 perches situate in the parish of Drewsteignton. The property is well situate for working, intersected by good roads and bountifully supplied with fertilising spring water for irrigation. From the situation of the woods, and never-failing rivulets, game might be encouraged to any extent. See census returns below for subsequent occupants. The handsome farmhouse was given a Grade II listing in 1985. The English Heritage description is as follows. Farmhouse. Probably 16th century core, rebuilt in mid-17th century, refurbished in late 19th century, modernised 1984. Plastered cob on rubble footings; brick and granite stacks all topped with late C19 brick; slate roof (formerly thatch). Originally a 3-room-and-through-passage house facing south-east with service room at left (south-west) end. In 18th or 19th century inner room end extended one room and in 19th century service room refurbished and stair built blocking rear passage door. End stack to service room, axial hall stack backing onto former passage and inner room stack in former gable-end. Irregular 5-window front of late 19th and 20th casements with late 19th century repartite sash at left end. Late 19th century 4-panel door with overlight and monopitch slate-roofed hood to passage. 1984 French windows near right end (former inner room). Roof half-hipped each end. Good mid-17th century interior features to hall and inner room. Both have chamfered crossbeams with bar-scroll stops, chamfered window lintels with scroll stops and granite fireplaces with ogee moulded oak lintels with enriched chamfer-scroll stops. The lintel of inner room fireplace was raised in height in late 19th century with insertion of brick side oven. Left of this fireplace is winder stair to first floor where chambers divided by plastered cob-nogged framed partition. Roof not accessible. Service end rebuilt in late 19th century. John Drew, age 60, agricultural labourer and family. Richard Newton, the then tenant of both Howard and Teignholt, was living at Teignholt, but moved soon afterwards to the much bigger house at Howard. William Newton age, farmer of 224 acres, employing 4 labourers and 5 boys. With him at Howard are his wife and three children, plus 4 unmarried farm labourers aged from 42 to 10. William Newton, aged 52, farmer of 230 acres, with his family, a house servant, a shepherd, 2 carters and a cattle boy. William Tucker, farmer aged 24, with his wife and 3 children, 3 farm servants and a visitor. The first mention of Medlake is in the Assize Rolls of 1238, and there was another court case involving it in 1249. Over the ages it has been spelt variously Medlak (1238); Medelak (1249); Middle Lake (1739): and Midlake. According to The Place-names of Devon, the “Med”- is from meadow and the “lake” comes from the Old English lacu, stream or watercourse. So it means meadow streamlet. The farm could well date back to Saxon times; alternatively, it may be one of the many farms created when the Plantagenet kings sold to the Men of Devon the right to clear the Royal Forest that covered much of the area in the early 1200s. The fact that there is a long drive to the farm from the road may indicate the latter, as when farmers were clearing new land it is thought that they first made a path into the forest and then built a dwelling and cleared the land around the dwelling to create their farm. In 1842 the farm had 95 acres of land, a reasonably-sized farm for Hittisleigh. It is unclear whether Medlake was originally part of the Manor of Hittisleigh or part of the neighbouring Manor of Lampford which belonged to the Fulfords of Great Fulford in Dunsford. By the 1700s, it certainly belonged to the Fulfords and it was being treated by them as part of the manor of Lampford. But they may have acquired it by purchase from the holder of Hittisleigh Manor and incorporated it into Lampford manor – there was quite a lot of swapping of land between neighbouring manors. In 1768, the Fulfords sold the freehold of Medlake to help pay off debts. They sold it along with a property called Five Beacons Down to John Frost (who was the sitting tenant at the time), subject to a continuing annual rent of 1s which the Fulfords were still collecting in the 19th century. By 1817, Frost appears to have sold Medlake to William Gorwyn of Hole in Cheriton Bishop (1750-1817), as William’s will bequeathed it to one of his younger sons, George Lambert Gorwyn (1784-1862), valuing it at £999. Thus was to begin a 140-odd year period of occupancy by the Lambert Gorwyn family. George appears to have lived there until at least 1826. But he then moved to a farm in Cheriton Bishop, although apparently continuing to farm the land at Medlake and using the house for farmworkers. By 1866, George’s son John Lambert Gorwyn (1813-after 1890) had moved to Medlake with his family, and when he died it was taken over by his son William Lambert-Gorwyn (c.1874-1919), who farmed it together with neighbouring Davyland. William’s son John Lambert-Gorwyn (1885-1956) was the last of the Lambert-Gorwyn family to farm there. The farmhouse is a typical cob and thatch Devon longhouse, probably dating to the 16th century. There is a local belief that the farm was once a manor house which oversaw part of the Fulford estate, possibly with a steward in residence. Farmhouse. Probably early-mid 16th century. Plastered cob on rubble footings; granite stacks topped with 20th century brick; wheat reed thatched roof. Original 3-room-and-through-passage facing south with inner room at east (right) end and 19th century granary and stores added to service room to left. End stack projecting from inner room and hall stack backing onto passage. Cob walled outshot to rear of service room with corrugated iron lean-to roof (formerly thatch). 2 storeys. Vaguely balanced 4-window front to main house with 19th and 20th century casements, some with glazing bars. 19th century front passage door behind 20th century glass-sided porch to left of centre. Granary and stores left of house has first floor granary with flight of granite steps, a small unglazed first floor window to left and brick lined doorway against left side of stairs. The left end is slightly recessed and includes a doorway. The end corner is mended with brick which batters out as a clasping buttress. Rear elevation is blind apart from rear passage door and full height recess at right end to inner room, possibly from projecting stair turret. Interior not inspected but said to be unmodernised and include high quality 16th century features. Both sides of passage are lined with oak plank-and-muntin screens. Hall and inner room fireplace said to be exposed and hall said to include a beam carved with repeating fern leaf motifs identical to those on early 16th century wall plate of Church of St Andrew, Hittisleigh. Original roof said to survive. Barn. Probably 18th century. Cob and rubble; corrugated iron roof. Barn with opposing double doors to threshing floor, faces east. Full height double doors with small monopitch hood left of centre and first floor hayloft loading bay to right. Roof hipped each end and supported on 4 oak A-frame trusses with pegged lap-jointed collars. Included for group value. Earlier spellings: Tyngeholtford (1622), Tinholtford (1660s), Teignholtford (1872), Little Teignholt or LowerTeignholt [i.e Teignholt Cottage] 1795, Teignholt Fords 1795. “Holt” means wood. Teignholt, along with Spreytonwood (originally Spreyholt Wood) was part of a great swathe of ancient forest that ran all the way from Spreyton to Cheriton Bishop. In medieval times, Teignholt was the name given to the whole northern section (or tithing) of Drewsteignton. This area continued to be called “Teignholt Hamlet” well into the 19th century. It was, however, detached and incorporated into Hittisleigh in 1894, so Teignholt Cottage and Teignholt Ford now lie in Hittisleigh. The first reference so far found to a property called Teignholt Ford is in a law-court document of 1622, which states that Richard Carew of Anthony in Cornwall had a freehold interest in a “messuage and tenement called Tyngeholtford … and also of land called Tyngeholtford” in the parish of Drewsteignton. The Carews were the lords of the manor of Drewsteignton and owned the farms that were part of the Manor. They were mostly absentee landlords and rented out their farms and smallholdings in Drewsteignton for income. The Drewsteignton parish records show that in the 1660s and 1670s Henry Zeager was the “Overseer” for “Tinholtford” (the occupants of the different farms took it in turn to act as Overseers of the Poor, responsible for administering the Poor Law in the parish). Zeager must therefore have been the tenant at the time. The fact that there is no early reference to “Teignholt” but only to “Teignholt Ford” indicates that Teignholt Ford (close to a convenient ford of the Troney) was the important property at that time. What is now “Teignholt Cottage” may have been a later division from it. It seems that sometime in the 18th century both Teignholt and Teignholt Ford passed into the possession of the Cann family of Fuidge in Spreyton, who had made a lot of money out the Drewsteignton lime quarries and kilns and used it to buy numerous properties in Drewsteignton and Hittisleigh. They also acquired, for instance, the much larger nearby farms of Howard or Heyward and Westwood. In 1796, William Cann is recorded as taking an apprentice for “Teignholt”. William Cann died in 1801. He bequeathed Howard, his then place of residence; Westwood; “Teignholt Fords and Little Teignholt (otherwise Lower Teignholt)” in Drewsteignton and other lands to his brother George Cann. The latter died only a few years later after a fall from his horse while riding at Howard, bequeathing the properties to his nephew George Lambert Gorwyn of Falkedon in Spreyton. Teignholt and Teignholt Ford were to remain in the Lambert Gorwyn family until 1872. They were let for income and various tenants are recorded over the years. Of what did these properties consist? 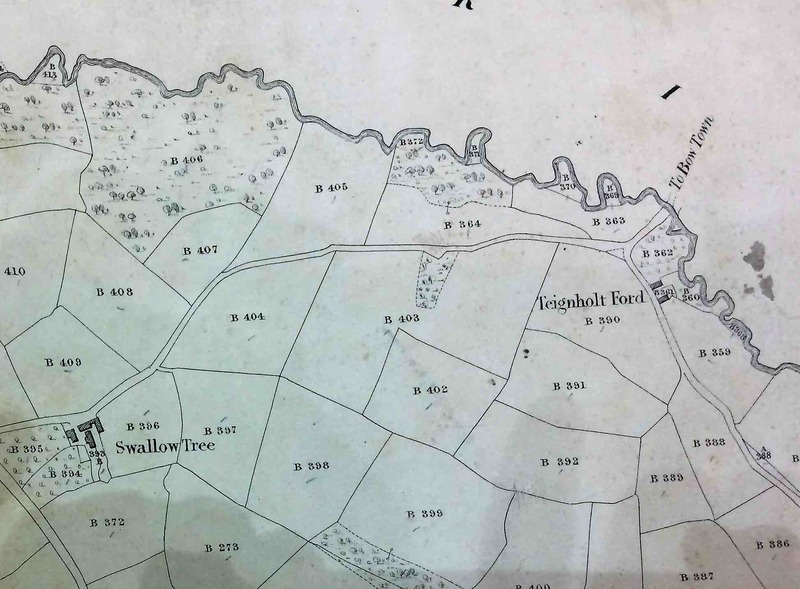 By 1839, when the tithe map for the Teignholt Tithing of Drewsteignton was drawn, what is now Teignholt or Teignholt Cottage seems to have consisted of some 20 acres of land running along the Troney. The tithe map shows substantial farm buildings. Little more than the cob and thatch dwelling now exists, the latter having been was saved from ruin by repairs in the 1960s. According to a survey done in the early 21st century, the core of the house dates to around the 1680s (contrary to the 1985 English Heritage description which dates the building entirely to the 19th century). It seems to have been built from the beginning as two cottages with a single central chimney and two back-to-back fireplaces. For most of its life it remained two dwellings, probably for the use of farm labourers. It has now been converted into a single house. Cottage. Mid-late 19th century. Plastered cob on rubble footings; rubble or brick stack topped with brick; thatched roof. 2-room house facing north-west, away from road. Central axial stack serving back to back fireplaces. 2 storeys with lofts. 2-window front of late 19th and 20th century casements, some with glazing bars. Central door with 20th century porch and water closet. Roof gabled to left and half-hipped to right. Unglazed loft ventilator in right end and horizontal-sliding sash to rear (road). Plain carpentry detail inside. Teignholt Ford was immediately to the north, a long thin property squeezed between the Troney and the road, either side of Quince Cross. We do not know what the size was of Teignholt Ford in the 1600s, but by the time of the tithe map in the mid-19th century, it consisted only of some 17 acres of tiny fields and included a “homestead and yard” next to the road close the present Quince Cross. Indeed, by then its alternative name was “Quince” – a name whose origins are mysterious. The tithe map shows two buildings facing each other. Although it must have started as a farm, by the mid-19th century it appears to have been used to house farm labourers, as can be seen from the census results below. It is recorded as unoccupied in the 1901 census, no doubt because it was in a bad state of repair. From then on it probably gradually decayed. Only one of the buildings appears in subsequent Ordnance Survey maps. There is no way of telling from the current remains what the original buildings looked like. At the time of the 1839 tithe apportionment, both properties, along with Howard, belonged to Richard Lambert Gorwyn (who lived in Exeter) and were let to Richard Newton. The tenancy was subsequently taken over by William Newton, probably his son, and then by William Tucker. It seems likely that these tenants farmed Howard and the Teignholts as a single unit, putting farm labourers in the cottages at Teignholt and Teignholt Ford. In 1872, after the death of Richard Lambert Gorwyn, his children got into debt and were forced to sell his entire estate. A press notice in the Western Morning News of 30 August that year lists the properties, including “All those FREEHOLD ESTATES called “Howard,” otherwise “Heyward and Teignholt,” and “Teignholtford” in the parishes of Drewsteignton and Hittisleigh, containing about 223 acres”. At the auction in September, however, “Howard and Teignholt” failed to reach their reserve. They seem to have been acquired sometime after the sale by a Mr Edward Reed, who also purchased Teignholt Ford. The press notice goes onto say if the property were not sold as a whole, it would immediately be put up to auction as two lots: Howard and Teignholt; and Teignholt Ford. It seems that this is what happened and only Teignholt Ford was sold, as “Howard Barton”and “Teignholt” were back up for sale in May 1878. They were acquired by John Jackman, originally from North Tawton but by this time running a wholesale saddlers at 138 Long Acre in London. The two properties were subsequently split between different members of the Jackman family and Teignholt Cottage is still in the hands of a descendant of the Jackmans. Teignholt Ford was acquired by Mark Cann, a somewhat enigmatic figure. It is not clear how, if at all, he was related to the various other Canns in the area. He was born in about 1824 in Okehampton, but seems to have lived most of his life in Plymouth, first running a bakery and then as a bookseller. His wife came from South Tawton, and it is possible that he was related to one of the South Tawton Canns. But it is nevertheless odd that a bookseller in Plymouth should have purchased this remote sliver of land on the Troney. When he died in 1904, he bequeathed Teignholt Ford to his son Ralph Thomas, a medical practitioner. And when Ralph Thomas died in 1931, he left the property to a fellow doctor, Francis Verdon, who sold it on. Teignholt Ford is not mentioned at all; and “Teignholt” is housing William Newton with his household of agricultural labourers and apprentices. This is slightly odd as one would expect him to be at the presumably larger house at Howard (which is occupied by a farm labourer). It may be that there was some temporary problem with the house at Howard, as the Newtons are back there in 1851. Richard Newton, farmer aged 70, with wife Ann and son William, age 32. William ?Vickery, agricultural labourer age 20; Mary Rowe, farm servant aged 18; and 3 agricultural apprentices aged 18, 11 and 7. Moses Woolland, agricultural labourer aged 50, with his wife, son, father John Woolland (a retired farmer), 2 brothers who are both agricultural labourers, a sister in law employed at home, nephew and servant (aged 12). William Newton age, farmer of 224 acres, employing 4 labourers and 5 boys. With him at Howard are his wife and three children, 4 unmarried farm labourers aged from 42 to 10. William Rowe, agricultural labourer aged 36, and family. Maria Burrage, 23, charwoman, with her infant daughter. These properties were in Drewsteignton until the late 19th century when that part of the parish of Drewsteignton was added to Hittisleigh. There is a story that the Ponsford family of Drewsteignton were granted a coat of arms by Queen Elizabeth I for supplying oak for the Navy from Westwood. Westwood was part of the Manor of Drewsteignton, which was owned for many generations by the Carew family, so any 16th century Ponsfords would have been tenants rather than owners. There may be further information on early tenants in the Drewsteignton manorial records that are in the Cornwall County Record Office or in the uncatalogued Ponsford papers in the Devon Archives..
Sir Coventry Carew, Bart., of East Antony in Cornwall, in his will dated 1747, created a complicated trust under which the Manor, including Westwood, came into the hands of his kinsman Jonathan Rashleigh of Menabilly in Cornwall. In 1749, Rashleigh let the property to Zouch Powell of Tywardeth in Cornwall on a 99-year lease determinable on the lives of Jonathan’s young sons (ie the lease ended when they had both died if that was sooner than 99 years – a common form of lease at the time). Rashleigh reserved for himself the rights to the timber, hunting, hawking, fishing and fowling and to all minerals, including specifically blue slate, healing stones and limestones. The rent was 17s. 4d., plus 2 capons at Michaelmas. There was also a herriot of the tenant’s best beast (a herriot was a payment made by the tenant at the death of each of the people on whose lives the lease was determinable). Zouch Powell had also do service at the courts of the Manor of Drewsteignton and act as tythingman (constable). The lease appears then to have passed to William Cann of Haywood or Howard in Hittisleigh, as there is a 1769 deed by which Cann sub-let the remainder of the lease to Henry Deymant, yeoman of Crediton. William Cann of Haywood died in 1801 and in his will left Westwood to his brother George Cann of Falkedon in Spreyton. George Cann died in 1804, leaving his property, including Westwood, to his nephew George Lambert Gorwyn of Spreyton (1763-1837). But there is an 1808 deed which indicates that the Carew family was at that time still the owners of Westwood, but with a lease in the hands of William Mackworth Praed of Lincoln’s Inn. Under this 1808 deed Praed sub-let the property to George Lambert Gorwyn for 70 years at a yearly rent of £42. It seems, therefore, that what William and George Cann left to their heirs was no more than the remainder of a 99-year lease that George then renewed. Coloured maps survive of both Westwood and Trayhill, dated 1834, showing that by that time George Lambert Gorwyn was definitely the owner of the property, having presumably purchased it from the Carews. However, he never lived there (he lived at Falkedon), and probably let both properties. 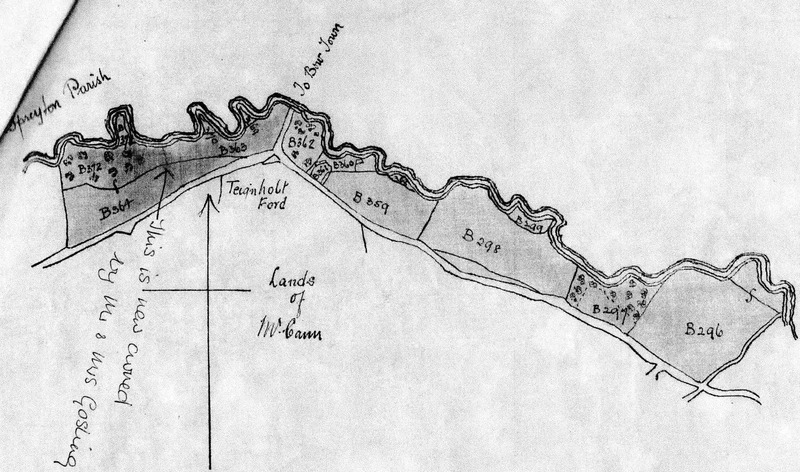 Westwood is shown on this 1834 map as consisting of 107 acres. When George died in 1837, he left both farms together with a number of other properties to his grandson, another George Lambert Gorwyn (although this one later dropped the Gorwyn from his name). Under this George, whose dates were 1818-1885, Westwood was continuously rented out. At the time of the tithe apportionment in 1842 it was described as a property of 124 acres and was let to a William Ford. But he probably did not live there, as at the time of the 1841 census it was occupied by an agricultural labourer called Stephen Hatherleigh and his family. The farm has quite a lot of good land and the wood is still extensive. Nevertheless, it may not have been an easy farm, as the tenants changed frequently – although this may also have been because George favoured short leases). In 1843, George gave a 10-year lease of the property to Henry Clark, an innkeeper in Drewsteignton. George retained the woodlands on the property for his own use. Henry Clark was still there at the 1851 census, recorded as farming 107 acres with four labourers, but by 1861 the census records the farmer John Haydon as living there, so he probably took it on at the end of Clark’s lease. George let it for another 10 years from 1864 to Robert Joslin of Lapford, together with 25 acres of the neighbouring estate of Trayhill, making a total of some 145 acres, for an annual rent of £70. In 1871, Joslin was recorded as living there with his wife, four grown-up sons (one of whom was a non-Conformist Minister) and two servants. By the time of the 1881 census, the tenant was Henry Ponsford. He died in the early 1980s and his widow struggled to keep the farm going and finally gave it up in 1904, by which time George Lambert Gorwyn had died and the property belonged to his son George Lambert MP (1866-1958). The latter then let it along with Trayhill on a 7-year lease to Eliza Endacott, a widow, and Albert Henley, both described as farmers from Spreyton. The yearly rent for the two properties was £60, plus an extra £10 for every acre of pastureland ploughed up against the terms of the lease. In 1921, Eliza Endacott purchased the freehold of the properties for £1,700. Farmhouse. 16th century with 17th century extension and improvements. Plastered cob on rubble footings; rubble and granite stacks topped with 20th century brick; wheat reed thatched roof. L-shaped building. Gable-ended main block facing north-east has 3-room-and-through-passage plan with inner room at right (north-west) end and dairy wing added in the 17th century to rear of inner room. End stack to service room and axial hall stack backing onto passage. 2 storeys. Irregular 3-window front of 20th century door set left of centre. Granite ashlar chimney shaft with moulded coping to hall. Interior: Service room has late 17th century rubble fireplace with oak lintel chamfered with straight cut stops, stone side oven doorway, cloam oven and pitched slate floor. 19th century crossbeam and lower passage screen. 17th century oak plank-and-muntin screen beyond back of hall stack. Large hall fireplace with oak lintel. 16th century oak plank-and-muntin screen at upper end of hall has been moved to end wall of inner room to create larger space. 16th century possibly true cruck truss over hall and 17th century A-frame truss with dovetail-lap collar over service room. Roofspace inaccessible. Rear block contains dairy with unheated chamber over. Westwood: adjoining barns. 16th century, extended in late 17th-early 18th century. Plastered cob on high rubble footing; corrugated iron roof (formerly thatch). Long range facing north- east, 2 storeys high throughout comprising small 16th century barn at right (north-west) end, large central barn and small left barn, both latter are late 17th-early 18th century. 19th century cartshed to front at right end, with lean-to roof. To left large 16th century oak shoulder-headed door with 20th century hayloft loading bay over. Both other barns have large doors, the centre barn with ventilator to right. The right hand barn has 2- bay roof with 16th century oak truss of massive scantling with true cruck principal to front and ordinary principal to rear, pegged lap-jointed collar and some of original trenched purlins. Also axial beam to hayloft of massive scantling. Other barns have A-frame trusses with pegged lap-jointed collars, 5 bays to centre and 3 to left. Trayhill no longer exists, its land incorporated into Westwood. It was a small farm adjoining Westwood, presumably also part of the Manor of Drewsteignton belonging to the Carews. It was also known as Tray Hill or simply as Hill. A list of Hittisleigh tax-payers in 1332 includes a Walter atte [at] Hulle, and this is probably the earliest mention of Tray Hill. By 1834 Trayhill had been acquired by George Lambert Gorwyn of Falkedon (163-1837); the map of that year shows that it consisted of 38 acres. On his death in 1837 it passed with Westwood to his grandson George Lambert Gorwyn (1818-1885). In 1841 it was let to William Clark, presumably a relation of the Henry Clark who had Westwood. Later George Lambert Gorwyn split the land, leasing some fields with Westwood, and the remaining 9 acres to a Mr Ponsford. He took over the house for his own use and lived in it for many years. He was recorded in the 1861 census as living there with a housekeeper and domestic servant; by the 1871 he had married his domestic servant and was living there with her and their son George, the future MP and 1st Viscount Lambert. This George Lambert Gorwyn was a quarrelsome man, much disliked by his neighbours. In the mid-1870s, he had a long quarrel with William Harrington Battishill, like George a big local landowner, over where the boundary between Westwood and Battishill’s farm Lower Falkedon lay. It seems that The Troney stream which formed the boundary had changed its course and George claimed a small bit of woodland called Millbottom that Battishill considered was his. George refused all attempts at mediation, finally suing Battishill successfully for trespass and damages after Battishill had cut some timber there. Battishill was not the only person with whom George quarrelled. In about 1880, a man called Davies who had a grudge against him came to the Trayhill with a friend and set fire to a woodrick. The fire spread to the house and other buildings which where destroyed, leaving only the barn. In the 1950s, old people in Hittisleigh could still remember how George Lambert Gorwyn had been “burnt out” of Trayhill. A question was also raised later over the ownership of a small piece of land between Westwood and another neighbouring farm, Fursdon. In 1918, when the then owner of Fursdon wanted to sell it, his lawyer wrote to George Lambert MP querying who owned this plot. The lawyer explained that, although the plot was thought to belong to Fursdon, according to local gossip George Lambert’s ancestor had won it at cards from a previous owner of Fursdon. Although it was not uncommon for landowners to gamble their fields in this way, in this particular instance George Lambert was able to point out that the story was unlikely to be true, as both Fursdon and Westwood had belonged to his great-grandfather, George Lambert Gorwyn of Falkedon (1763-1837), who had divided them between his two grandsons.